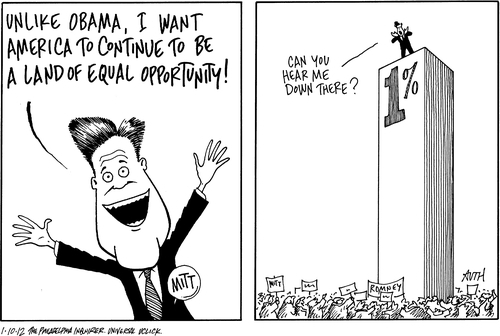 One of the great conservative panders is that liberals want equal outcomes while conservatives want equal opportunity. The problem with this statement is not just that it is false, but that equal opportunity is both a myth and a practical impossibility. One need only contemplate the disparity in income between men and women, the higher unemployment rates among minorities, Republican opposition to Pell grants, and the decline in social mobility in the U.S. to realize that equal opportunity not only does not exist, but is unlikely to be achieved anytime soon. Through prudent regulations, more progressive tax rates, pro-labor policies, and improvements in our educational system, we may be able to decrease historically high disparities in outcome. After all, from the Franklin Roosevelt through the Jimmy Carter administrations when both the middle class and the American Dream thrived, percentage increase in income was independent of income bracket. Only since the advent of trickle-down economics by President Reagan have the wealthiest Americans benefited disproportionately, indeed almost exclusively, in income growth. We may be able to restore more nearly equal sharing of economic growth across income levels, but equal opportunity will remain an impossible dream. Seeking greater equality of opportunity is a worthy goal, but if we continue to focus our efforts exclusively on the chimera of perfect equality of opportunity at the expense of the historically demonstrated possibility of more nearly equal outcomes, we will surely fail. Concentration of wealth will continue to the point where social instability results. The patience and apathy of the 99% is great, but not infinite.